Flight attendants walk out of the plane in Gongga Airport in Lhasa, capital of southwest China’s Tibet Autonomous Region, Dec. 15, 2011. The first non-stop flight from Beijing to Lhasa made its four-hour maiden voyage on Thursday. A new non-stop flight between Beijing and Lhasa, which is expected to boost tourism in the Tibet autonomous region, went into operation on Thursday. Yet, Air China’s new flight takes passengers direct on Airbus 319 planes, shaving two hours off the travel time. 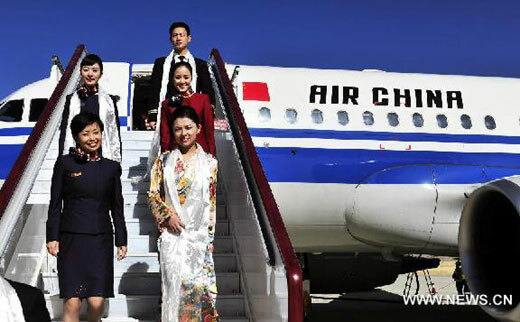 The aircraft, which have about 130 seats, have been modified to cope with flying from Lhasa airport, which sits 3,700 meters above the sea level, said Wang Changshun, general manager of China National Aviation Holdings, Air China’s parent company. "It (the Air China service) shortens the distance between Beijing and Tibet and shows the central government’s concern about Tibet’s development," said Qin Yizhi, deputy chairman of the autonomous region.